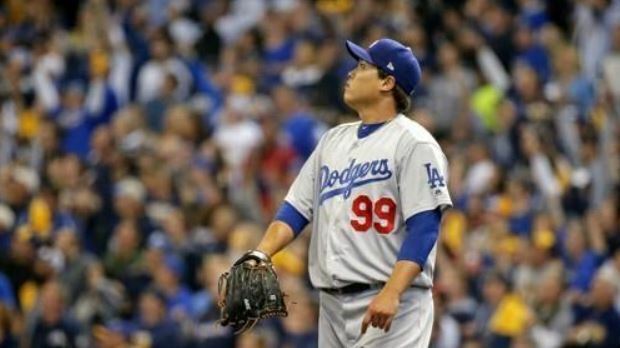 Los Angeles Dodgers' South Korean starter Ryu Hyun-jin will try to pitch his club to their second straight World Series. The left-hander will start Game 6 of the National League Championship Series against the Milwaukee Brewers at 7:39 p.m. (Central Time) on Friday, which will be 9:39 a.m. Saturday in Seoul, at Miller Park in Milwaukee. Given how much is at stake, this just may be the most important start of Ryu's six-year major league career. The Dodgers lead the best-of-seven series 3-2 after a 5-2 victory at home Wednesday and another win will send them to the World Series for the second consecutive season. In 2017, the Dodgers fell to the Houston Astros in seven games. Their last title came in 1988. Ryu will get a shot at personal redemption, after allowing two runs on six hits in 4 1/3 innings in Game 2 last Saturday. Ryu got a no-decision after the Dodgers rallied for a 4-3 victory. One of those six hits was a home run by No. 8 hitter, Orlando Arcia. Ryu held the Brewers off the board but came unglued in the fifth. Arcia's home run came with one out in that inning, and Ryu gave up a single and a double to the next two batters before getting pulled. Ryu had a much better showing in the NL Division Series versus the Atlanta Braves on Oct. 4. He got a surprising Game 1 nod ahead of three-time Cy Young Award winner Clayton Kershaw and delivered seven shutout innings in which he gave up just four hits and struck out eight for a 6-0 win. This will also be Ryu's rematch with Milwaukee's southpaw starter Wade Miley, who got two hits off Ryu at the plate. Miley started Game 5 on Wednesday but was lifted after walking leadoff Cody Bellinger on five pitches.